This easy weeknight recipe is paired with blistered tomatoes and a simple lemon butter sauce for an easy seafood recipe! Our new favorite mahi mahi recipe. Today is an especially happy Monday, actually, because today The Sustainable Seafood Blog Project (SSBP) is inducting its 3rd Blog Partner Class! (Cue applause and confetti and me dancing around in my kitchen because woooooo). I am so excited to welcome four new food bloggers to the SSBP Partner Roster: Vanessa over at Becoming Ness, Kaylin at Enticing Healthy Eating, Jessica of Stuck on Sweet, and Julie from In A Half Shell. They are all fabulous bloggers (and wonderful people! ), so make sure you take a few minutes to stop by their blogs and tell them hello! To celebrate our new partner class (as well as our All-New 2015 Conference!) I made you some seriously delicious (and ridiculously easy!) pesto crusted mahi-mahi. And because we’re internet BFFs, I threw in some blistered tomatoes and a super simple lemon butter sauce to top it all off. It takes all of 30 minutes to throw together, and calls for ingredients you probably already have floating around your fridge and pantry. I’m a big fan of mahi-mahi, because it’s a nice, hearty fish that holds up well in the freezer. It’s also fairly easy to find mahi-mahi that comes from well-managed, healthy fisheries! Seafood Watch classifies U.S. Atlantic troll or pole caught as a “best choice” option, and has three other “good alternative”-ranked mahi-mahi sources: U.S. longline-caught, Hawaii troll- or pole-caught, and Ecuadorian longline-caught. Side note: “troll” sounds like a scary word, but when fishermen “troll,” it really just means they are casting several individual fishing lines into the water at the same time (read more here and here). Trolling has a very small incidence of bycatch – accidentally catching a species you aren’t fishing for, like a turtle or shark – and if bycatch does occur, it’s much easier to free an accidentally caught species and return it to the ocean than with other fishing methods. A good fishmonger (when in doubt, visit the fish counter at Whole Foods or Wegman’s) will be able to tell you where a fish came from and how it was caught. It can be a little intimidating to ask a bunch of questions while you’re at the fish counter, but a friendly, knowledgeable fishmonger makes the process much easier and more comfortable – they’re happy to talk to you about their products! Plus, it’s worth braving a bit of fish-counter nervousness to be sure that you’re buying sustainably-caught seafood! Be sure to check out the new SSBP Blog Partners posting today, and take a look at our Resources Section to learn more about sustainable seafood! 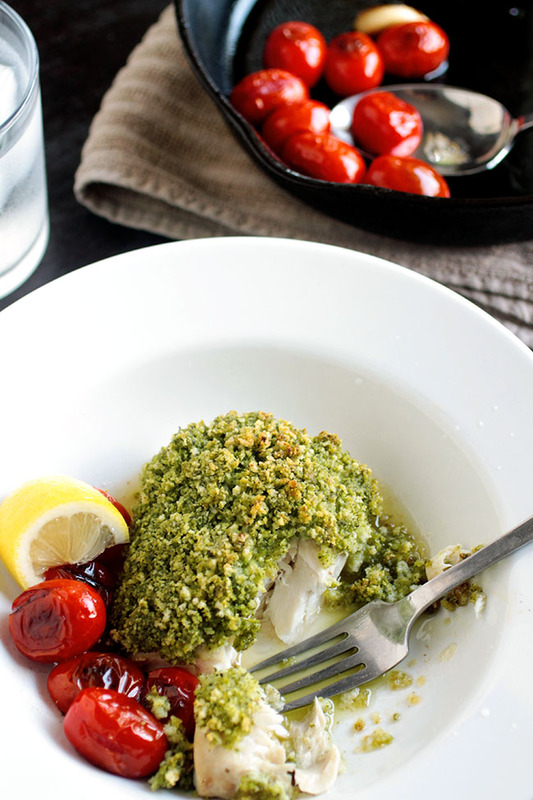 A simple and delicious mahi mahi recipe with a pesto crust and blistered tomatoes. 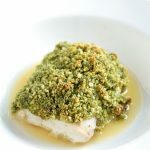 In a medium bowl, mix pesto and breadcrumbs together until they form a coarse paste. Taste and add seasoning as necessary. Place mahi-mahi portions on a large baking sheet. 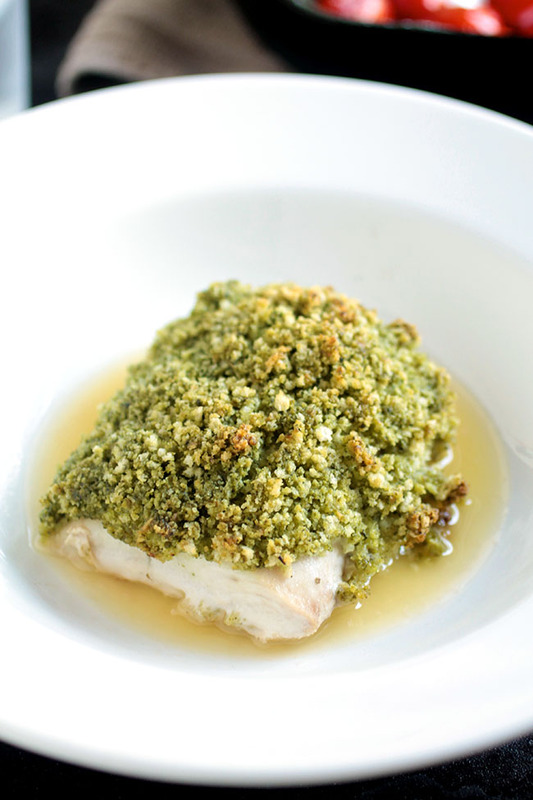 Spread pesto mixture evenly across all four mahi-mahi portions. 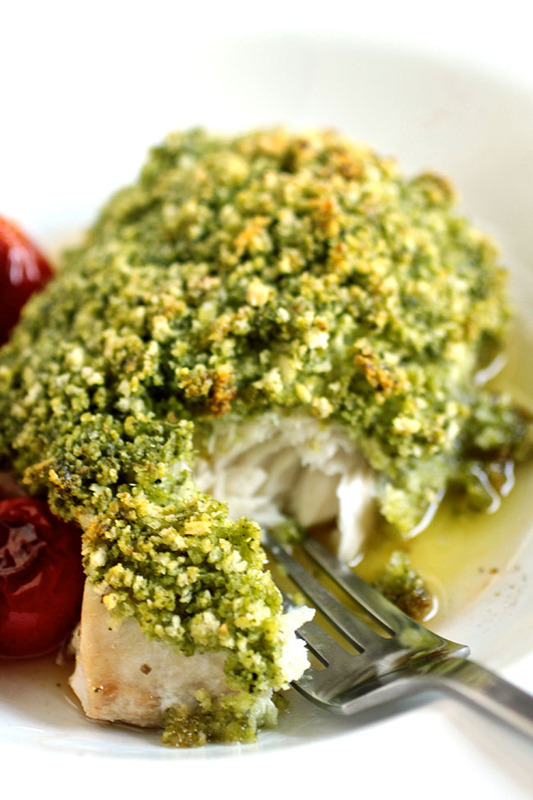 Use your fingers to pat the pesto mixture down into the fish to form an even crust. Bake mahi-mahi at 375 for 12-16 minutes, until cooked through. Fish should reach an internal temperature of approximately 145 degrees fahrenheit. 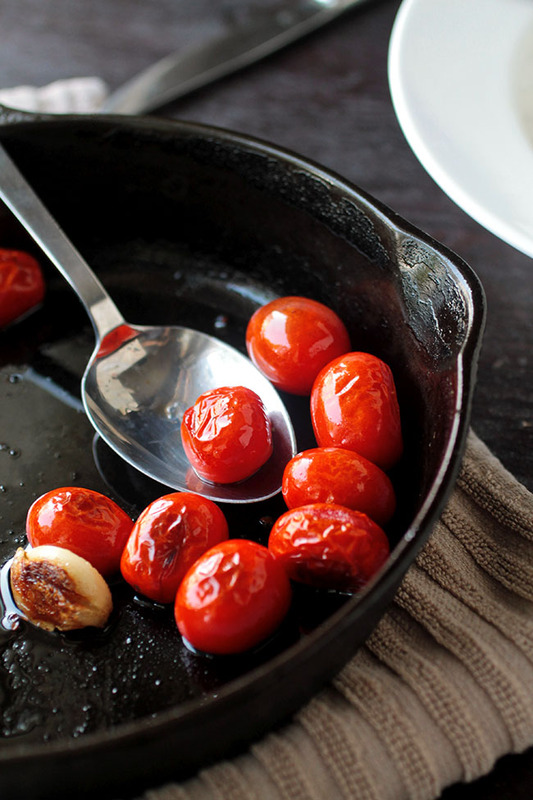 While the fish cooks, prepare the blistered tomatoes. Heat olive oil over medium-high heat in a cast iron skillet. When oil simmers, add tomatoes and garlic clove and let cook without stirring for 2-3 minutes. The tomatoes will pop and sizzle a bit, so keep an eye out for flying oil or tomato juice. Season tomatoes with salt and pepper to taste. When tomatoes have begun to blister, give them a stir to turn them over so that the other sides can start to blister as well. 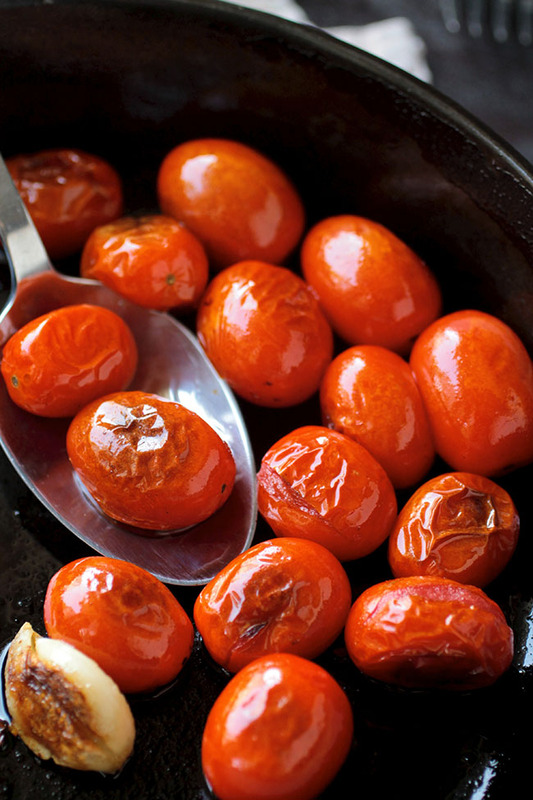 Cook an additional 2-3 minutes without stirring, until tomatoes are softened and have charred and blistered on all sides. Heat oil in a medium, nonreactive skillet over medium heat. When oil simmers, add shallot and sauté for 1 minute until shallot has softened. Whisk in lemon juice, lemon zest, salt, and pepper and remove sauce from heat. Let cool 2-3 minutes, until sauce has stopped simmering but is still warm. Whisk in butter 1 pat at a time, whisking constantly after each addition until the whole pat is melted into the sauce before adding another. Continue whisking in butter pats until all butter is incorporated into the sauce. Serve immediately. If your sauce breaks, don’t worry – just give it a zap with an immersion blender to emulsify it again and bring it all back together. Drizzle a bit of sauce on the bottom of a plate or pasta bowl. 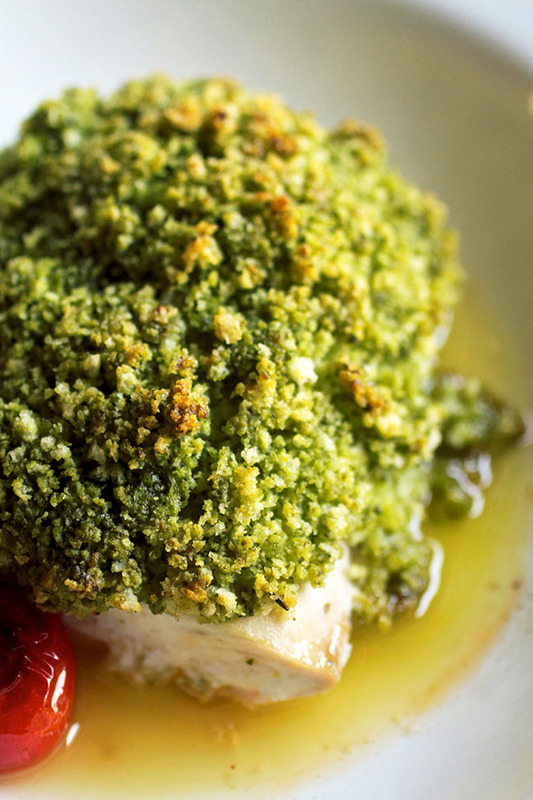 Place pesto crusted mahi-mahi on top of the sauce and top with blistered tomatoes. Add a lemon wedge for garnish and serve immediately. this was amazing! Thank you for the recipe, I can’t wait to make it again. Also, the amount of time this takes to prepare and make is so quick, I can definitely see it being a weekly go to. Thank you! I’m so happy you liked it! This has definitely become one of our weekly go-to recipes. Thanks for letting me know how it turned out! yummy! My husband and I enjoyed it with steamed veggies. Loved it! Thanks for sharing. I’m so glad you liked it – thanks for letting me know how it turned out! My son went fishing with his grandfather and caught a huge salmon. I was just thinking of trying it with pesto. Your recipe sounds amazing! Thanks for sharing! Yay for new Partners!! Must check out their blogs! And loveeeee this mahi maui – SO my kind of meal! Thanks, Nicole! All the new bloggers are great – definitely check them out! wow that pesto crust looks amazing.. definitely recreating the recipe! Thanks, Thalia! I am a HUGE fan of this pesto crust.